Explosive devices were found inside multimillion-dollar show homes that burned in a suburb north of Seattle Monday, fire officials said. Authorities also found a spray-painted sign purportedly left by a radical environmental group at the scene. Fire Chief Rick Eastman of Snohomish County District 7 said fire crews discovered the devices inside the houses and were able to remove them. A total of five devices were found, reports CBS affiliate KIRO-TV in Seattle. A device in one home apparently didn't go off. The FBI said the fires in the four homes were being investigated as a potential domestic terrorism act. Agents from the FBI and Federal Bureau of Alcohol, Tobacco and Firearms were assisting local authorities in the investigation. No injuries were reported from the fires, which began before dawn in the wooded subdivision and were still smoldering by midmorning. The sign, a white sheet that had the initials of the Earth Liberation Front in scraggly red letters, mocked claims the luxury homes on the "Street of Dreams" were environmentally friendly, according to video images of the sign aired by KING-TV. "Built Green? Nope black!" the sign said. The fires started at a strip of unoccupied, furnished luxury model homes where developers show off the latest in high-end housing, interior design and landscaping. The homes are later sold. The blazes were set in multiple places in separate houses, Eastman said. He confirmed that the ELF sign was found at the scene of the fires in the community north of Woodinville, where some homes were still under construction. The ELF, or Earth Liberation Front, is a loosely organized collection of radical environmentalists authorities say is responsible for other arsons in the Northwest. ELF is considered a domestic terrorist organization by the FBI, reports CBS News correspondent Bob Orr. A woman is currently trial in Tacoma for a suspected ELF fire at the University of Washington in 2001. Briana Waters, a 32-year-old violin teacher, is accused of serving as a lookout while her friends planted a devastating fire bomb. The fire is one of the most notorious in a string of arsons that investigators say were perpetrated from the mid-1990s to 2001 by ELF. No one was hurt in the arson at UW, but its Center for Urban Horticulture was destroyed and rebuilt at a cost of $7 million. It was targeted because the ELF activists mistakenly believed researchers there were genetically engineering trees, investigators said. The homes are in a development near the headwaters of Bear Creek, which is home to endangered chinook salmon. Opponents of the development had questioned whether the luxury homes could pollute the creek and an aquifer that is a drinking water source, and whether enough was done to protect nearby wetlands. One of the people involved in the 2007 Street of Dreams said the homes used "Built Green" standards such as water-pervious sidewalks, super-insulated walls and windows and products made with recycled materials, such carpet pads. Advertising for last summer's Street of Dreams show focused on the environmentally friendly aspects of the homes, which were smaller than some of the huge houses featured in years past. "It's very disappointing to take a situation where we're tying to promote good building practices - Built Green practices - and that it's destroyed. It's extremely disappointing. I don't understand the logic in that," said Doug Barnes, the Northwest division president of Centex Homes in Kirkland and the immediate past president of the Master Builders Association of King & Snohomish Counties. He was a judge at the 2007 Street of Dreams. 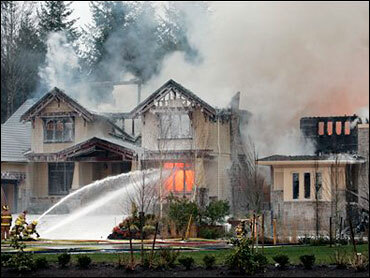 The homes that burned were between 4,200 and 4,750 square feet in size, with prices up to nearly $2 million. None of the five showcase homes from the Street of Dreams last summer had been sold, said Grey Lundberg, a builder of one of the houses.